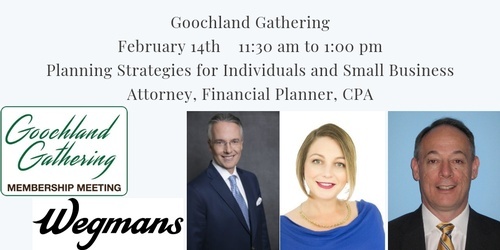 On February 14th, you will find us at Wegmans in Short Pump hosting a panel consisting of an Attorney, CPA, and Financial Planner. We will have Scott Golightly of Golightly Mulligan & Morgan, PLC; Christin Bonomonte of The Main Street Group; and Edward Blair of Blair & Assoc CPA's, PLC. Together they will be giving planning strategies for small business owners. The lunch is catered by Wegmans. The cost is $25.00. Chamber Members and their guests recieve a $5.00 discount.